[134 Pages Report] The fat replacers market was valued at USD 1.40 Billion in 2016, and is projected to reach USD 2.01 Billion by 2022, at a CAGR of 6.2% from 2017. The fat replacers market has been segmented on the basis of type, application, form, source, and region. This report includes an estimation of the market size in terms of value (USD million). 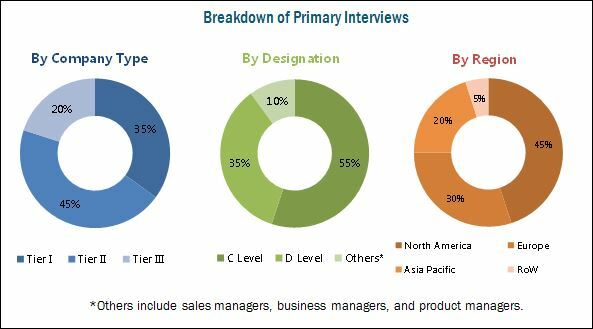 Both, top-down and bottom-up approaches have been used to estimate and validate the size of the fat replacers market and various other dependent submarkets in the overall market. Key players in the market have been identified through secondary research such as Hoovers, Forbes, and Bloomberg Businessweek, company websites, annual reports, and their market share in respective regions has been determined through primary and secondary research. All percentage shares, splits, and breakdowns have been determined using secondary sources and were verified through primary sources. The key players in the fat replacers market include ADM (US), DuPont (US), Cargill (US), Kerry Group (Ireland), FMC Corporation (US), Ingredion (US), Koninklijke DSM (Netherlands), and Ashland Inc (US). This research report categorizes the fat replacers market based on type, application, form, source, and region. The global fat replacers market witnessed steady growth over the last few years. The market size is estimated to be 1.48 Billion in 2017, and is projected to reach USD 2.01 Billion by 2022, at a CAGR of 6.2% from 2017. Increasing prevalence of obesity and the growing awareness about health and wellness are the major drivers contributing to the growth of this market. 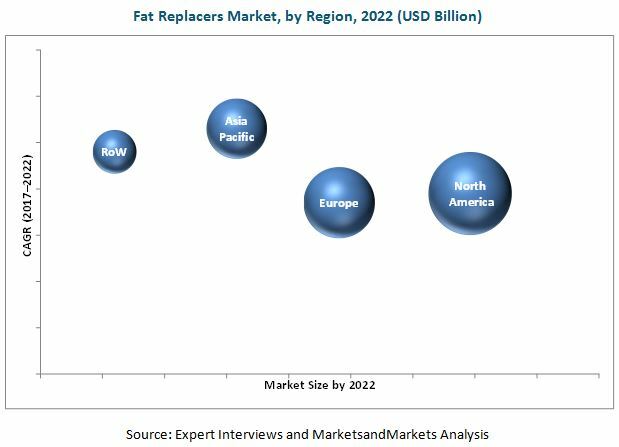 The fat replacers market, by type, is segmented into carbohydrate-based, protein-based, and lipid-based. The increasing demand for food products with high-protein content but low-fat content is expected to fuel the growth of the protein-based fat replacers market. By application, the market has been segmented into bakery & confectionery products, dairy & frozen desserts, convenience foods & beverages, sauces, dressings, and spreads, and others (functional foods and processed meat). The bakery & confectionery products industry led the market due to the increasing awareness about leading a healthy lifestyle. This led to the reduction of fat content in bakery & confectionery products, leading to the demand for fat replacers. By form, the market has been segmented into powder and liquid. The powdered segment accounted for a relatively larger market share as it is easy to use and maintain. This form of fat replacers is preferred for fried foods and bakery products. By source, the market has been segmented into plant and animal. The plant-sourced segment is projected to grow at a relatively higher CAGR. Animal-sourced protein is expensive to obtain, and therefore it is easier for food manufacturers to opt for plant-sourced fat replacers. The global fat replacers market was dominated by North America in 2016. Asia Pacific is projected to be the fastest-growing market from 2017 to 2022. The change in consumers’ eating habits in terms of western cuisine, as well as the growth in the processed food industry, has led to the need for fat replacers. The global fat replacers market is characterized by moderate to low competition. Expansions & new product launches are the key strategies adopted by the key market players to ensure their growth in the market. The market is dominated by players such as ADM (US), DuPont (US), Cargill (US), Kerry Group (Ireland), FMC Corporation (US), Ingredion (US), Koninklijke DSM (Netherlands), and Ashland Inc (US). *Details on Business Overview, Strength of Product Portfolio, Products Offered, Business Strategy Excellence & Recent Developments Might Not Be Captured in Case of Unlisted Companies.